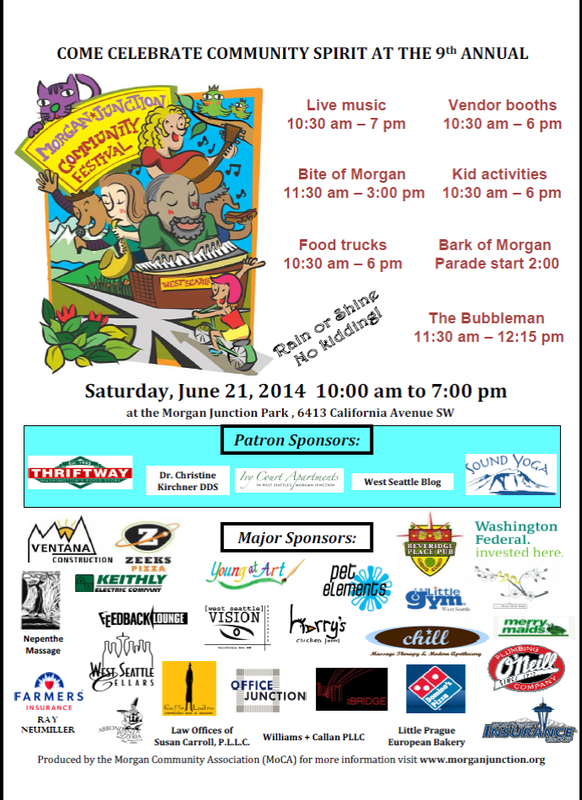 Join us at the Morgan Junction Community Festival! West Seattle Be Prepared will have an informational booth at this great neighborhood event! It’s this coming Saturday, June 21st. Look for us in the vendor area, which is in the parking lots behind Zeek’s Pizza and Beveridge Place Pub at the intersection of California Ave SW and Fauntleroy Way SW. We’ll be there from 10:30 until 5. Stop by to pick up updated emergency communication hub maps, free coloring books and other preparedness materials! This entry was posted in Announcements, Events, West Seattle Be Prepared and tagged Morgan Junction Community Festival, West Seattle Be Prepared. Bookmark the permalink.